NCache has three different editions available NCache Open Source, NCache Professional and NCache Enterprise. NCache Open Source is released under Apache License, Version 2.0. NCache is also available in full working Trial versions of NCache Professional and NCache Enterprise for initial 60 days use. 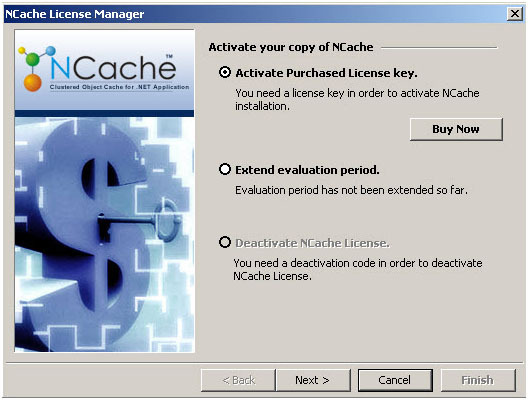 However, it is required to activate NCache after the evaluation period is expired using a purchased license key. 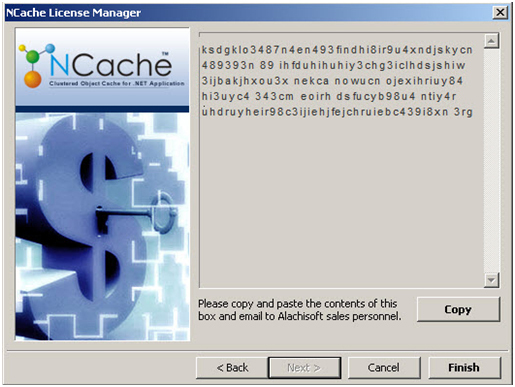 License keys are issued by our Sales department on purchasing NCache. There are two methods available for activating NCache, online activation and Manual activation. Go to "Start", "All Programs", "NCache", "Activate NCache". 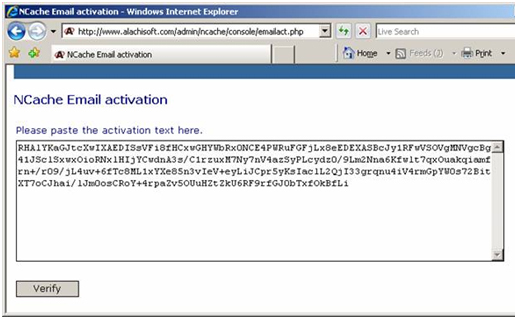 Right Click on "Activate NCache Tool" and select "Run as administrator". Click on the "Activate purchased copy of NCache" and press the Next button. You'll see the following screen. Please note that if you have installed Enterprise Edition of NCache, you'll only get the "Production License" option here. Similarly, if you have installed Developer Edition, you'll get the "Developer License" option. Just click Next button and you'll see the following screen. Here you get three different options to choose from. If your computer has Internet access, just select the Online (Recommended) option. 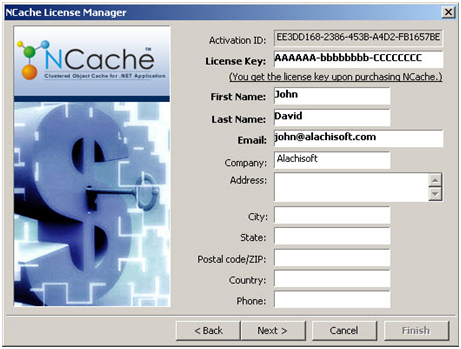 It will ask you to enter a license key and will activate NCache license for you immediately. When you click Next button, you see the final screen for activating your license. Just press Activate Now and it will activate NCache license for you immediately. However, if your computer does not have Internet access (which is the case in many production servers behind the firewall), then select Email option and click Next to see the screen below. 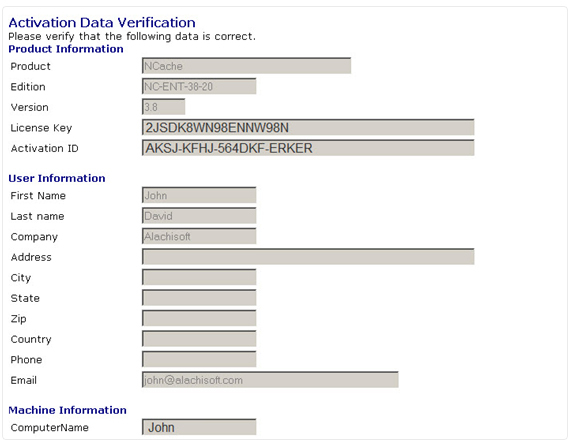 Paste the Activate Request Code into the text box on the following page and then press Verify. Take the above Activation Auth Code (shown as a long encrypted string toward the end of the page right above the red color message) and copy it to your clipboard. Then, go back to Activate NCache License program and select Manual activation option. Just paste the Activation Code here and press Finish button. 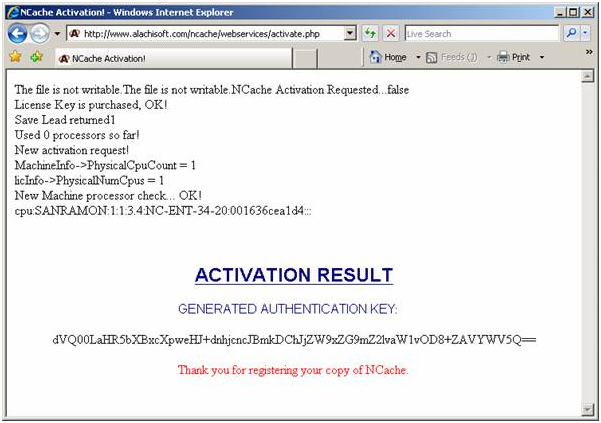 NCache will be activated on your machine and following screen will be prompted.